Prime Minister Netanyahu, Education Minister Bennett pay condolence call to family of American-Israeli man murdered in terror attack. 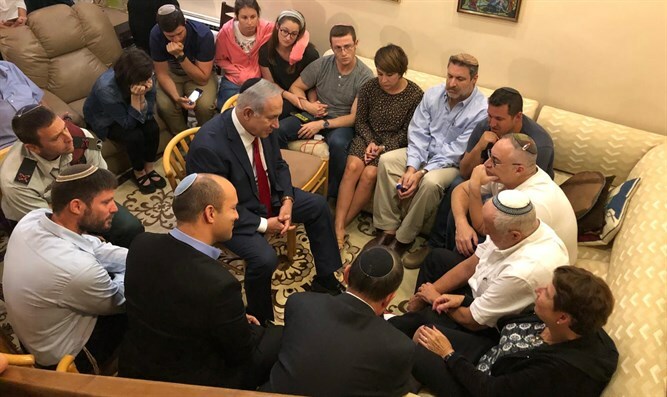 Israeli Prime Minister Binyamin Netanyahu, Education Minister Naftali Bennett (Jewish Home), Knesset Chairman Yuli Edelstein (Likud), and MK Bezalel Smotrich (Jewish Home) paid a condolence visit Sunday night to the home of the American-Israeli father of four who was stabbed to death Sunday morning in a terror attack in Gush Etzion south of Jerusalem. Ari Fuld, a 45-year-old immigrant from the US and resident of the Gush Etzion town of Efrat, was critically wounded Sunday morning after a 17-year-old Arab terrorist from the Hevron district stabbed him in the back. During the visit, Minister Bennett spoke with Fuld’s family, who shared some of the family history going back to the Holocaust and through to their decision to move to Israel. Fuld, a member of Efrat’s rapid response security team, managed to draw his firearm and shoot the terrorist after being stabbed. “He is an Israeli hero who in death saved others,” Bennett said. Ari Fuld’s parents, Yonah and Mary Fuld, shared details about their son’s military service during the Second Lebanon War in 2006 and his pro-Israel activism, and work to explain the situation in Israel to people abroad. Netanyahu also eulogized Fuld as a "hero of Israel", telling reporters shortly after his condolence call that Israelis would "always remember him". "I met tonight the wonderful parents and brothers of the wonderful hero of Israel, Ari Fuld. I embraced them in the name of all the people of Israel during their terrible grief. We're alive, thanks to heroes like Ari. We will always remember him."